New Label, Same High Quality Backing » Embroidery Talk Has Moved! Many people who have been embroidering for some time may already be familiar with the JSI red-shirt logo. This logo has symbolized quality stabilizer products for many embroiderers for a number of years. Because we know the significance of this logo, having used JSI products ourselves in the past, EnMart has created a new label for our backing products. Featuring the red t-shirt, this label also features the EnMart logo and our URL on a distinctive blue background. If you want quality backing products, this is the label you need to see when you open your next backing order. High quality backing is one of the foundation stones of any good embroidery project. 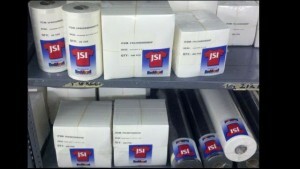 EnMart has always proudly carried the JSI line of backing from QST. John Solomon Inc. (JSI) is a name that has long been linked with quality stabilizer products, and QST has carried on that tradition of excellence since they acquired the company. The JSI product line offers a wide variety of premium stabilizer options, as well as specialty items like poly mesh, Badgemaster and fusible products. JSI backing is of wet-laid construction, which means that the fibers are dispersed in a solution and then dried. This creates a multi-directional, uniform non-woven, which has even quality and won’t stretch. The non-directional construction means that the tearaway backings of this type will tear easily in all directions. Wet-laid backing also provides for a more even sheet of backing, avoiding the lumps, bumps and thin spots that can occur with a lesser quality stabilizer. This entry was posted on Wednesday, November 16th, 2011 at 1:30 pm and is filed under Backing/Stabilizers. You can follow any responses to this entry through the RSS 2.0 feed. Both comments and pings are currently closed.